The Spaatz Association is proud to announce Spaatz Award Recipient #2000 — New Jersey Wing Cadet Col. Matthew Jackson. 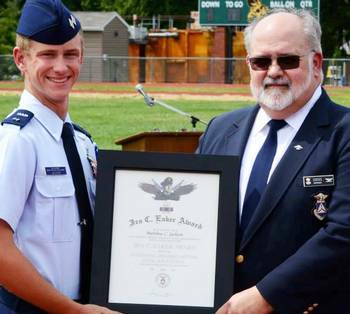 Association President, Lt Gen Ted Bowlds, notified Cadet Jackson of his award on August 10th. C/Col Jackson will be the guest of the Association at the 2015 Air Force Association National Convention in Maryland, where his award will be presented. The most elite group in Civil Air Patrol’s cadet program gained its 2,000th member today – a milestone 50 years in the making – when Cadet Col. Matthew Jackson of the New Jersey Wing’s Twin Pine Composite Squadron achieved the Gen. Carl A. Spaatz Award. Jackson, 17, joined his Trenton-based squadron and CAP in 2010 and has participated in many training opportunities, including a glider flight academy and numerous encampments, as well as CAP’s last two annual legislative days on Capitol Hill in Washington, D.C. He is pursuing an appointment next year to the U.S. Air Force Academy. Cadet Lt. Col. Matthew Jackson receives the Gen. Ira C. Eaker Award at the 2015 New Jersey Wing Basic Encampment graduation on Saturday. Presenting the award to Jackson is Col. Joseph Sirois, Northeast Region vice commander south. Earlier today, Jackson learned he is also the 2000th recipient of the Gen. Carl A. Spaatz Award – CAP’s highest cadet honor, wh ich carries with it promotion to cadet colonel. The award is named in honor of Gen. Carl “Tooey” Spaatz, the first chief of staff of the U.S. Air Force. Along with another pilot, he set an important flight endurance record in the early days of aviation, and during World War II he commanded the Allied air campaign, including the bombings of Hiroshima and Nagasaki. When he retired from the Air Force, Spaatz served as the first chairman of CAP’s National Board. Spaatz No. 1, presented in November 1964, was awarded to Col. Douglas C. Roach of CAP’s Michigan Wing. Roach served as a highly decorated Air Force pilot in the Vietnam War and went on to fly with the famous Thunderbirds. When he retired from the Air Force, he continued in public service as a congressional aide who served both sides of the aisle prior to his death in 2013. Other notable Spaatz recipients include Air Force Col. Eric Boe, Spaatz No.648. He is a distinguished graduate of the Air Force Academy and NASA astronaut who piloted Space Shuttle Endeavour in 2008 as well as Discovery in 2011. Another is Kevin Redman, Spaatz No. 722, who went on to work on optics for the Hubble Telescope for NASA. Others have made their marks outside of aviation and aerospace, as doctors, writers, and even actors. Spaatz cadets are expected to follow Spaatz’s example, serving as role models for junior cadets and later becoming leaders in their communities. To qualify to take the Spaatz exam, cadets must prove themselves as “servant-leaders” by succeeding in ever more challenging duty assignments and leadership expectations. The successful Spaatz candidate averages five years to progress through 16 achievements and four milestones in the CAP Cadet Program. In that time they serve as mentors and instructors, attend and staff numerous activities, complete rigorous testing in aerospace topics, attend dedicated high-level leadership schools, maintain a high level of personal fitness and live CAP’s Core Values. During the actual four-part Spaatz exam, a cadet must pass two proctored written exams, one on leadership and one on aerospace. Both tests are comprehensive exams of all the materials a cadet has studied since they joined. A written essay is also required; evaluated at CAP’s National Headquarters, the essay requires the cadet to analyze an ethical issue and articulate a thoughtful, persuasive, well-organized response. A further required component is physical fitness, assessed by a candidate’s successful completion of a mile or shuttle run and various exercises. Joining the ranks of Spaatz recipients can have life-changing effects, said CAP Brig. Gen. Rich Anderson, former Spaatz Association president and Spaatz recipient No. 193. “I earned the award in 1972, and the training that led to it resulted in a degree of discipline that has impacted my life in many positive ways,” he said. Anderson went on to serve in the Air Force for 30 years, retiring as a colonel six years ago. He now represents Northern Virginia in that state’s legislature. He also served as CAP national commander from 1993-1996. “Everything I have done was directly influenced by my CAP cadet training and specifically by the leadership opportunities that arose out of being a Spaatz recipient,” he said. Curt Lafond, CAP’s director of cadet programs and Spaatz No. 1,030, knows firsthand what achieving a Spaatz takes and what the recipients are ready, willing and able to give back to their communities and their country. “What the Spaatz Award really represents is a young person’s ongoing commitment to service and excellence, a commitment to a journey,” Lafond said. I am wondering if the election has been held. I haven’t seen any information or announcements. The last info I read reported the election was to close yesterday. Let me know if I missed it? We didn’t receive enough nominations to hold a full election this year. The Association will post an announcement on the new Board according to its bylaws within the next week. Watch the website for details.